Even California can’t apparently support high-speed rail. 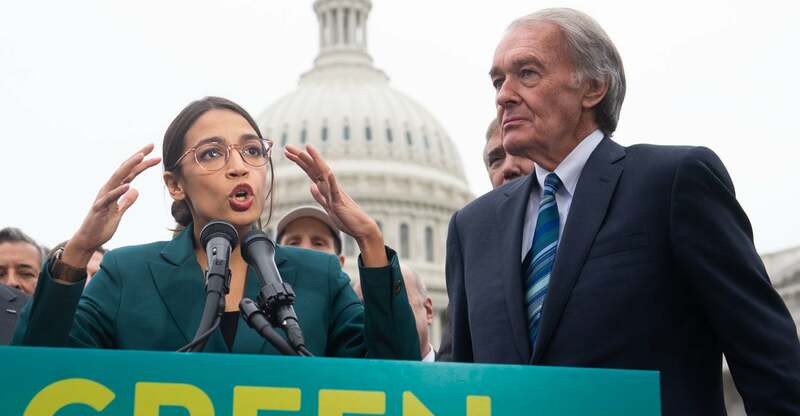 The Green New Deal put forward by Sen. Ed Markey, D-Mass., and Rep. Alexandria Ocasio-Cortez, D-N.Y., hinges on, among other things, the United States becoming criss-crossed with high-speed railroads. But if even left-leaning California can’t pull off high-speed rail, who can? The Green New Deal has drawn a lot of criticism—and rightly so. Although this deal has nearly zero chance of passing both chambers, the ideas it promotes, such as high-speed rail, would cause a great deal of costly damage if adopted. Fully detailing the logical and logistical flaws in the resolution and the accompanying FAQ document would easily fill a book, so for the purposes of brevity, let’s focus on transportation. The resolution calls for the expanded use of electric vehicles, as well as more public transportation and high-speed rail (though it’s very short on the details of how this would be accomplished). None of those would be unusual proposals from big-government politicians. Although the proposals in the FAQ are radical, they’re exactly what would be necessary to fulfill the stated purpose of the plan: to reduce carbon emissions to nearly zero and return to President Franklin Delano Roosevelt’s vision of government control over the economy. If high-speed rail did not make sense for a wealthy, high-population area such as coastal California, it makes even less sense for the nation’s heartland. The expense it would take to build high-speed rail lines connecting every city in the country large enough to have an airport, followed by continual operation subsidies, would be stratospheric. Public transit for residents of every suburb, exurb, and small town would be wildly expensive, inefficient, and inconvenient. Do we imagine fleets of buses roaming the vast expanses of Wyoming, Kansas, and the Dakotas in a vain search for passengers? And what about the goal to “replace every combustion-engine vehicle”? First, it should go without saying that if the federal government wants everyone to drive an electric vehicle, it wants nobody to drive a nonelectric vehicle. Ultimately, the Green New Deal seeks to use the issue of the environment to impose a grand vision for a planned society—one with high taxes, less choice, and even more reliance on politicians in Washington, D.C.